The sudden death of architect Dame Zaha Hadid last Thursday in Miami has been a shock. At the hight of her career, honoured with several awards, including the RIBA Gold Medal in the beginning of this year, she was a pioneering force in a male-dominated profession, occupying a global position as one of the most influential female figures in contemporary culture. 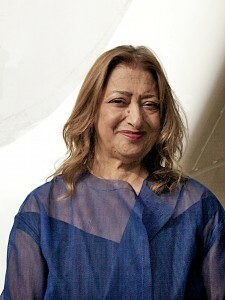 Miami had become Zaha Hadid’s second hometown, a stopover in her busy travel and work schedule. The tropical climate and beautiful light brought out the best in her flamboyant designs. Zaha was the favourite artist of local collector, property developer and Design Miami patron Craig Robins. She was often referred to by her first name, like royalty. Her glamorous personal style was combined with a uncompromising mind, which evoked an image of a diva. 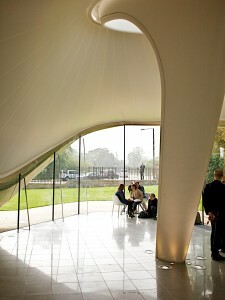 But as many have pointed out Zaha Hadid was incredibly generous, warm and supportive of creative projects around her. I remember seeing her at London’s Serpentine Sackler Pavilion press launch, immaculate as always and a little frail as she walked in supported by her long term collaborator Patrik Schumacher. She had a star-like presence – a starchitect no doubt – underpinned by honesty, which could feel intimidating. In a recent Desert Island Discs programme she admitted that she didn’t like ‘to overdo the flattery and complimenting’, which could have seemed rude to some people. More than other architects Zaha was grilled about political situations of the countries that she was working for. At the Serpentine opening it was British broadcaster Jeremy Paxman, who was questioning Zaha about human rights issues in Azerbaijan, where one of her most spectacular designs for a cultural centre was being finalised in Baku. She said it was a public building for the people, not a private palace, and she couldn’t see what was the problem. Our small editorial team was incredibly excited when we got an interview with Zaha Hadid prior to the 2012 London Olympics and the launch of the Aquatics Centre. Open for everyone now, it is a spectacular public building, and surely the most beautiful swimming pool in London, if not the world. Her approach was unique and daring, not always fitting the urban realm of congested cities. But her legacy as an artistic visionary, which launched in 1988 alongside Frank Gehry, Daniel Libeskind and her mentor Rem Koolhaas in the Deconstructivist Architecture exhibition at MOMA in New York, lives on and can be experienced in many public buildings.